This was the first issue of Superman that I picked up since the New 52 started up almost three years ago. I had been reading Action Comics, but dropped it around the eighth issue. My only real exposure to Superman has been through Batman/Superman, Superman Unchained, and Superman/Wonder Woman (I’m currently only following the latter). Now felt like a good time to see what was going on in Supes-proper. I’ve heard some pretty mixed reviews about Lobdell’s recent work, but knowing that I would be reviewing this book, I decided to keep an open mind. I’m glad I did because I rather enjoyed the issue. I can’t comment as to how it stands in the rest of the series, so I have to go off of what is advertised. 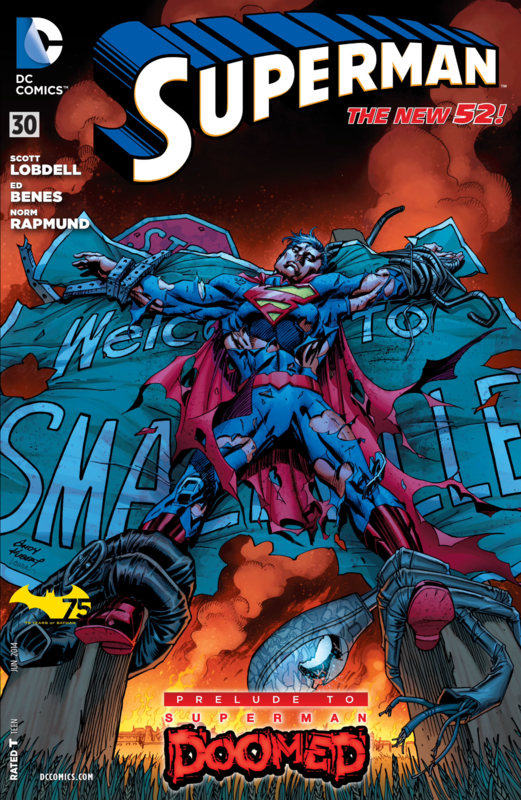 Right on the cover it says “Prelude to Superman: Doomed,” and it is just that. 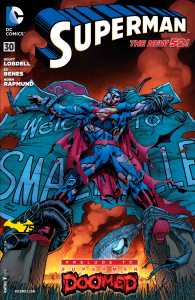 This is the calm before the storm, and Lobdell is able to crank up the tension for the inevitable doom that is about to befall Superman. Lobdell also brings readers up to speed by showing us the existing state of affairs in the various aspects of Superman/Clark Kent’s life. These little nods filled us in on some relevant information, and created some avenues to go down for people that want to explore some back issues. All-in-all, this was not heavy on exposition and felt naturally integrated into the rest of the issue. The focus was kept on the various anomalies popping up in the world that Superman is both aware and not aware of. I like the alphabet soup mixture of dramatic irony, obviousness, and mystery. With each bite we get something we all know, something we know but Superman doesn’t, and some sort of mystery meat (the good kind, I think). I don’t read too much DC right now, but there really seems to be a “DC look.” It reflects the Jim Lee concept work before the relaunch. I personally enjoy it. Ed Benes, Norm Rapmund, and Pete Pantazis all do great work on the issue as well, and capture that “DC look” in this issue. The art is clean. The colors are vivid. There is also a feeling of movement in the panels. Benes is able to capture the look DC loves, but sets it apart from some of the more static, posed work in some other Superman titles. Give it a look. For those interested in the upcoming “Doomed” crossover event, Superman #30 is a good place to come on board and learn about the current status quo in the realm of Superman. 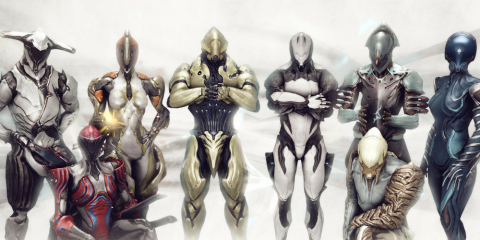 The issue is relatively light on action, but makes up for it by giving us several plot resolutions to look forward to, and leaving some enticing threads to pull.